Do you struggle to balance your need for natural light and privacy? Windows and glass walls transmit beautiful light from the sun and foster the open-space feel that so many office environments are moving towards, but they can also compromise your privacy. Thankfully, you don’t have to choose one or the other. Decorative window film allows you to customize a space to your desired level of brightness and privacy. Decorative films serve multiple purposes. They help control privacy, reinforce your brand, and add visual interest on interior and exterior glass walls. Frosted films provide a similar aesthetic to etched or sandblasted glass, but at a fraction of the cost. Decorative window film allows you to tailor the level of privacy for your space. Some varieties of decorative film are nearly opaque, while others offer only a slight decrease in visibility. The more opaque the film, the less natural light is able to pass through. Perhaps your conference room has glass walls, and you feel like you’re in fishbowl during board meetings. You can simply frost the middle horizontal section of the glass that is at eye level to passersby. Many of our commercial clients at Carolina Solar Security use decorative window film to reinforce their brand. We do this by cutting out their logo or company name from the frosted film. This creates a subtle yet eye catching signage solution. Decorative window film adds visual interest to your space. With over 100 patterns, colors, and textures, the aesthetic possibilities are truly endless, and you can create a one-of-a-kind environment for your office, lobby, retail space, hotel, or restaurant. Decorative films can be applied to both exterior-facing windows and interior glass walls. If your office is located in a suite within a larger office building, you can frost the entryway door and emblazon it with your company logo. This also works well for glass door entrances of businesses within shopping centers or standalone buildings. You no longer have to choose between privacy and natural light. With our decorative window film solutions, you can find the perfect balance between confidentiality and aesthetics. Carolina Solar Security is a Prestige Authorized 3M™ Dealer in Wilmington, NC. 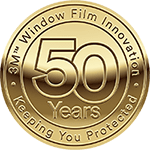 We have been providing Southeastern North Carolina with decorative window tinting solutions since 1985 and never stop working to bring our customers the best products paired with the most skilled window film technicians. Reach out to us for your free quote today!